This bacterial zoo-noses is transmitted as an infectious disease even in people from infected animals, products and by-products produced from them. In the brucellar infection map in all world Albania is also included, among the endemic dissemination countries. In 1988 our country was declared healthy from brucellosis. But political and economical changes that occurred in our country after 1990, brought a significant increase of brucelar infection in animals, as a result people were infected too. Therefore, the object of our study is the dynamics of the spread of brucellosis in humans at Korca’s region for the years 1999-2009. Please cite this article as: Puto K, Papa S, Hila N. DYNAMIC SPREAD OF BRUCELLOSIS IN HUMANS IN THE AREA OF KORCA FOR THE YEARS 1999-2009. J of IMAB. 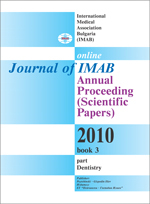 2010; 16(3):11-16. doi: 10.5272/jimab.1632010_11-16. 1. Andoni G.G. La brucellose, techniques de laboratoire, Deuxieme edition, O.M.S., Geneve, 1997. 2. Andoni R. The bacteriological diagnosis of infections in the clinic Page 464, Tirana, 1983. 3. Babameto E. The spread of brucellosis in the sheep and goats of Dropull, The Buletin of Natural Sciences, Tirana, Nr.3, 1957. 6. Brinley Morgan,W. J., and M. J. Corbel. 1990. Brucella infections in man and animals: contagious equine metritis, p. 547-570. In M. T. Parker and L. H. Collier (ed. ), Topley and Wilson’s principles of bacteriology, virology and immunology, 8th ed. Edeard Arnold, London, England.